Because I have some abnormal curvature in my spine, it can cause problems now and then. I used to have serious back problems for about six years that started when I was 28 years old, but my back has been in far better shape since then, even through a pregnancy when I had to still carry our 45 pound crippled collie up and down the steps and recently I have been doing all kinds of labor at the horse barn. I rarely have a problem with it at all these days...but I am today. 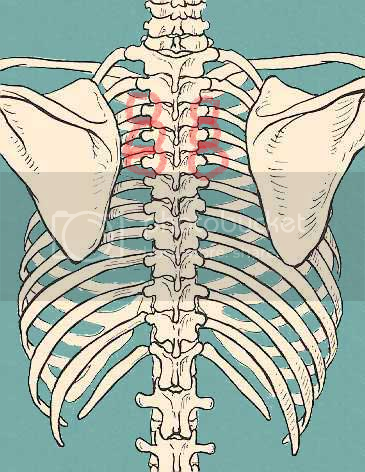 Apparently, a few of my rib heads were subluxated, chiropractic terminology to say that the beginning of the rib closest to the vertebral column is somewhat dislocated. Rib head subluxations have happened to me now and then over the years, but this time in a differing location than usual and it must have happened during a restless sleep, of all things! The problem is not so much the rib, but the muscle spasms that accompany its being out of place. It started on Saturday, but it was mild and sometimes the ribs slip back in place with just moving around. Not this time, of course. Sunday I did go to church but wished I had not by the time we came back home as the spasms worsen while sitting in the chair there. Monday,...well, I cannot really describe the pain level of the spasm I began experiencing Monday morning. I would liken it to childbirth, except the child is coming out of my mid back on the left side. Actually, it felt as if being stabbed, breathing gets really difficult, and torso distorts into a paralyzing twist. On a scale of 0 to 10 with 10 being the worse, I think I have been spiking at 9. I nearly passed out a couple of times and then I really wished I had because it was so intense. I am thankful that the spasm does subside so that I am not in pain all the time, but they were lasting longer and longer. Three days is usually my pain limit with rib heads. My husband had taken the day off Monday for other reasons and I am always amazed, by the grace of God, that I do not have these flare ups when he is away. He drove me to the closest chiropractor, as we see two different ones with the farther one being an hour away, but nearby on our Thursday errands. The ten-minute drive to the close one was agonizing enough. I spent some time getting therapies to relax the muscles as much as possible. The adjustment was not a painful as it could have been, but the muscle spasms persisted all the day afterward with movement, which I tried not to do at all. They were spiking around 8 yesterday, but usually did not last as long as they did in the morning. I always feel stiff but better in the mornings, getting worse later on, but the last time I fasted and got better as the day went on. I may go back in for another adjustment today to be sure the the rib heads are holding in place. I did begin fasting Monday as it has been my experience that usually reduces muscle spasms and soreness faster and I expect to be quite sore, perhaps, for most of the week, unless my Lord intervenes. So far, my husband planning to be in town for the day, the week actually, but plans change with his job so I never count on him being available. I was supposed to take in my consignment items yesterday, but I rescheduled that for Wednesday afternoon. Knowing I would still be sore today, I called to have someone else feed the horses at the 4-H barn this morning--good thing too because I am still having spasms at level 6 this morning. I am hoping this will not take all week to get over, as I am suppose to face paint all day Saturday for the 4-H Spring Fling fundraiser. The irony stings. So sorry you have been unwell. I know you have been pain free for a while. I should listen better. I had a feeling something was up. MAy your healing complete quickly. Well, I wanted some time off the regular schedule, but I would have rather spent it preparing the gardens during the lovely weather days or something more productive than trying not to move much and causing spasms when I do.